Are Woodpeckers Beneficial or a Nuisance? It's true that woodpeckers often cause damage to wooden structures, but they also eat a lot of destructive insects. We usually hear woodpeckers before we see them. Unless I see a woodpecker at a bird feeder, I usually have to look way up in a tall tree before I can find the bird. A good pair of binoculars help, too! Most woodpeckers stay in the same area year after year, except for a few varieties that migrate. In the United States, there are 21 species of woodpeckers. The most common are the hairy woodpecker, the downy woodpecker, and the yellow-bellied sapsucker. Woodpeckers (depending on species) can live 4-11 years. They have a long sticky tongue to capture and drag out insects they find in holes. Most species feed on insects such as termites, carpenter ants and beetle larvae, which live in or around wood. Woodpeckers have a head designed like a shock absorber as they peck and hammer to locate insects and build nesting cavities. Flickers feed on insects from the ground. Other species feed mostly on nuts, seeds, and berries. 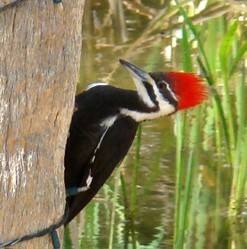 The sapsucker woodpeckers feed on insects but also on tree sap. They drill many rows of small holes in healthy trees looking for sap and the insects trapped by the sap. Acorn woodpeckers drill closely spaced holes just large enough to hold one acorn each. They often poke acorns between or beneath roof shakes, and fill unscreened rooftop plumbing vents or gutter pipes with acorns. Woodpeckers are resourceful, like this ladder-backed woodpecker using a cactus in the desert for breeding and roosting. Most species live in small social groups and live in the same area year round, although a few types such as the redheaded woodpecker and northern flicker are migratory. Woodpeckers are federally protected under the North American Migratory Bird Act. The Ivory Billed Woodpecker is the largest woodpecker in the world. Due to destruction of its habitat in the southeastern United States, this species probably became extinct in the 1960s or 1970s. There was a report in 2004 of a sighting, but it was not confirmed. Even after rewards were offered, no verified sighting has occurred. This image was a black and white photo taken in 1935 and then watercolored. image is on Wikipedia. I saw a woodpecker flying into a hole in one of these dead trees. When trees die, they can remain standing for ten years or more and these dead trees are called snags. Woodpeckers and other animals use snags to make nesting sites (woodpeckers don’t nest in living trees). Depending on the woodpecker species, they create nesting cavities at different heights above the ground. Woodpeckers breed in the spring with a short incubation period – around two weeks – although it can differ depending on the species. It’s common for woodpeckers to have 2 broods per year and some species may have 3 broods. Woodpeckers create new nesting sites every year and their old cavities are used by other hole-nesting species such as squirrels, owls and starlings. Woodpeckers nesting in snags can help keep wooded areas free of insect infestations. Dead trees (snags) don’t look attractive and people often cut them down in their yards or woods. But if a dead tree doesn’t pose a safety hazard and it's not touching your house, it’s best to preserve it as a wildlife habitat. Besides nesting in snags, woodpeckers also nest in human - made structures, such as wooden fence posts, utility poles, and buildings. So you still might find woodpeckers in areas that don’t have many trees. FOOD: To attract woodpeckers, you must offer them the foods they like. Although woodpeckers mainly eat insects, they especially like black oil sunflower seeds (not striped sunflower seeds). They also like peanuts, and fruits such as raisins and grapes. Platform bird feeders are best for woodpeckers because they give them them plenty of space to feed. Suet can also attract woodpeckers. Suet can be offered in a wire cage, a nylon mesh bag, or simply smeared on a tree they frequently visit. Suet should only be offered during cold weather. Suet put out in warmer temperatures melts and get onto the feathers of the head, causing them to mat and possibly fall out. SHELTER: Most woodpeckers do not migrate and remain close to their original area year round. They prefer to make their homes and nests in dead trees, but sometimes they might not be available any more. You can try to attract woodpeckers by installing woodpecker houses. If possible, houses should be hung in a tree, 15-25 feet above the ground. The dimensions of your woodpecker house depends on what type of woodpeckers you have in your area. Some people filling the house partially or completely full of sawdust to encourage birds to to remove the sawdust to the level they want. There is no single method to repel woodpeckers. What works for one species or in one area, may not work somewhere else. If you’re going to try to repel woodpeckers, use at least 2 different devices and alternate them every few days. VISUAL - Woodpeckers don’t like shiny objects. Sometimes woodpeckers peck on metal, though, if the metal is dull. Shiny silver (mylar) balloons hung to float near the area the bird is pecking often works. You can also try using mylar strips, old CDs, brightly colored plastic strips, aluminum pie pans and children’s toy windmills. Make sure they are attached or hung so the wind can blow them freely. Some people have used round magnifying-type shaving mirrors installed near damaged areas. Woodpeckers are usually not bothered by window panes where their own reflection can been seen, but maybe the mirror’s magnification scares them off. Loud noises such as hand-clapping, a toy cap pistol, and banging on a garbage can lid might frighten woodpeckers away from houses. You need to be ready to continue making noise each time the bird returns, until it leaves for good. You can buy lightweight plastic bird-type netting to place over the area the woodpecker is pecking. Leave at least 3 inches of space between the netting and the building so that birds can’t continue to peck through the mesh. Netting can also be attached to the eaves and secured back to the siding so the birds can’t get behind it. Large holes attract woodpeckers, so they should be repaired right away. Cover the holes with aluminum flashing or tin can lid and paint them to match the siding. Using quarter-inch hardware cloth to cover pecked areas is another good barrier. If your garden hose will reach the area where woodpeckers come, position it with a sprinkler set up on an angle. Turn on the hose and the woodpeckers will leave. They don’t like hanging on to a wet surface. There is an automatic motion detecting sprinkler on the market that you can use to chase away birds, or dogs and cats. Birds are smart - Your best offense to scaring away birds is to buy more than one product and move them often. blackspanielgallery - my aunt has a dead tree in her yard and I bring out a lawn chair and book and listen to a woodpecker peck away. I've been able to get a few good photos of it, too. I'm glad my aunt doesn't have the tree cut down. One thing hey are is beautiful. When I hear one pecking away I like to see it. jptanabe - I love woodpeckers, too. They didn't kill your tree, though. When they make a nesting hole in a tree, it's already dead. We always have woodpeckers around our house - especially the little downy ones come to eat the suet I put out for them. They are really quite brave and keep eating even when we get up close! We also have a pileated woodpecker sometimes - it made a huge square hole in one of our trees, which subsequently died and we had to cut it down. Not sure if the woodpecker killed it or if it liked because it was already rotting! Funny thing was a little while later I saw the woodpecker sitting on the stump looking for his tree! May Apples grow in moist shady areas and are native to the U.S. and Canada. They are actually an herb and the fruit is eaten by wildlife. Adélie penguins might not be the most popular of the penguins, but they sure are great swimmers. Learn more about Adélie penguins.